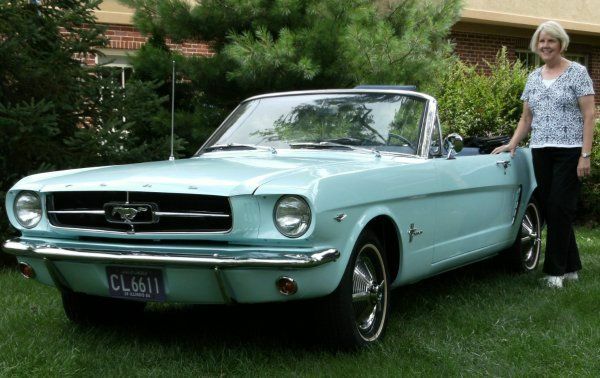 Ford Motor Company has sold millions of Mustangs to millions of people but the woman shown in the image above with the Skylight Blue 1964 Ford Mustang was the first person to ever purchase a Mustang - and she still owns it today. On April15th 1964, Gail Brown was a 22 year old elementary school teacher from Chicago who had never heard of the Ford Mustang. In fact, no one outside of Ford Motor Company even knew what a Ford Mustang was because the now-famous sports car hadn’t been introduced but when Miss Brown drove with her parents to Johnson Ford in Chicago to buy a new car. She had been driving her mom’s 1957 Ford Fairlane 500 Convertible and was in need of a car of her own and as she entered the Ford dealership, she had just two basic concerns – it had to be a convertible and it had to be cool. Gail Brown toured the dealership offerings with her parents and a salesperson but she was unable to find anything that struck her fancy. Upon telling the salesman that, he explained to her that he had something very special in the back that he wanted to show her. After leading her to a storage area in the back of the dealership, he showed Miss Brown and her parents a car under a cover. That car was a Skylight Blue 1964 Ford Mustang Convertible. As soon as she saw it, she knew that this was the car for her. After trading in a friend’s beat up 1958 Chevy for $400 and borrowing the rest of the $3,019 balance, Gail Wise purchased her new Ford Mustang on April 15th – two days before the car went on sale – making her the first ever Ford Mustang owner. Her Mustang was equipped with the 260 cubic inch V8 and the Rally Pac dash treatment. In 1966, after driving her 1964 Ford Mustang Convertible for almost two years, Gail Brown married Navy man Tom Wise and became Gail Wise. Tom left his Navy service in 1967 and by 1974, Tom had taken on the aging Mustang as his daily driver. By 1979, the first Mustang ever sold had suffered through 15 years of Chicago winters and the annual pounding of road salt had taken its toll as the Mustang was rusting badly while mechanical problems began to plague the sporty Ford convertible. During a rough storm in 1980, Tom came out of the house to find that the battery had been stolen so he pushed the Mustang into the garage and due to the struggles of family life with 4 kids, the Mustang spent the next 27 years resting in the Wise family garage. Although Gail talked about selling the Mustang to get it out of the way, Tom dreamed of restoring their 1964 Ford Mustang Convertible and in 2007 – that dream became a reality. Tom began the painstaking process to restore the Mustang back to its full original form from top to bottom and after three years of effort, the car was finished in the same pristine condition as when Miss Gail Brown purchased it back in April of 1964. Gail’s interest in having a cool convertible and Tom’s persistence in keeping the dream alive of having a flawless 1964 Ford Mustang paid off – and now this couple has the privilege of being the original owners of the first ever Ford Mustang.